Love the smell. Works great for both younger men and older. It's a very versatile smell that women of all types enjoy. Buy it. This user was entered into a sweepstakes after submitting their honest review. 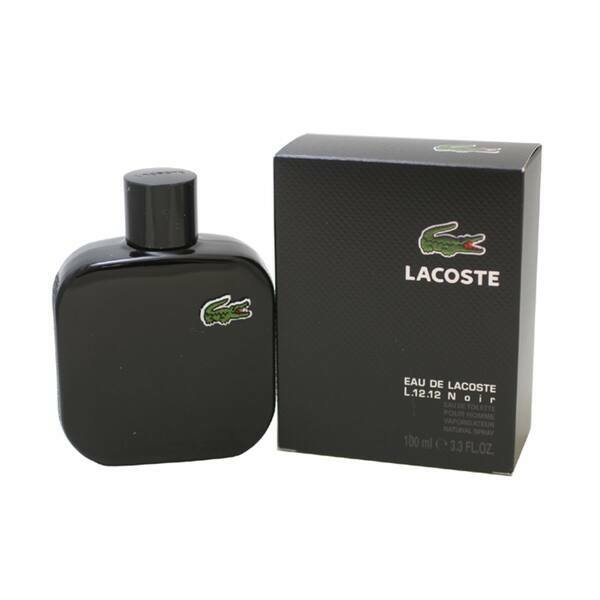 Emanate confidence with the L.12.12 Noir cologne by Lacoste. This fruity and spicy spray does not overpower in close spaces, and is versatile enough to wear in formal and casual settings. Overall, this Lacoste men's cologne smells amazing and isn't too strong or weak. I have been using Kenneth Cole Vintage Black and was looking to change and this one is perfect. I highly recommend it and if you're looking for something that doesn't smell too sweet or woody...then this is for you! Lacoste Noir is ok. Nothing special. Doesn’t last throughout the day. The better Lacoste scent is Blanc. This cologne has a sweet, but very manly scent to it! It is great for normal wear around the office or for special occasions. The dark bottle does make it hard to see when you are running low, but that's my only complaint! Love this new Lacoste fragrance. Very clean and fresh. Love the smell. Works great for both younger men and older. It's a very versatile smell that women of all types enjoy. Buy it. This is my favorite scent for a man. I always make sure my man never runs out. Not to overpowering and perfect for everyday or an evening out. I was trying to figure out what to give my boyfriend for valentines this year & this gift was the best choice. Excellent condition, arrived super fast & smelled great. He loved it ! Bought it as a thank you present. EVERYBODY can use it: teenagers, older men. Good for birthdays, holidays or just use it yourself. Love the smell, very manly, lasts long. Bought this for my husband for Christmas and he loved it!! Best price I found!! Bought it for my step dad and he loves it, great price too. "how many day's the order take "
my brother likes this one. this is the second bottle that I have bought for him.